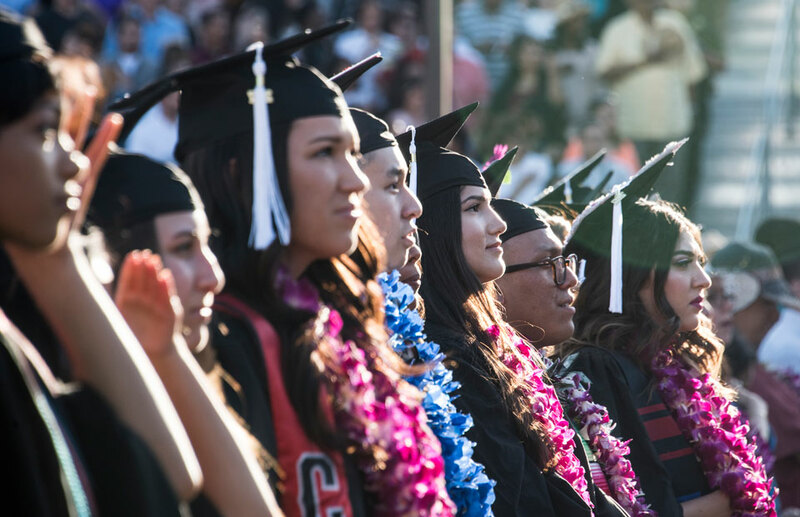 CSUN’s Office of Student Success Innovations was created to find ways to close the graduation gap by engaging and empowering faculty, staff and students to work collaboratively to develop ideas that expand educational equity and student success. Photo by Lee Choo. Recognizing that there is no single answer to ensuring students have the support they need to graduate, officials at California State University, Northridge have built a “village” — spearheaded by the Office of Student Success Innovations — to tap into a wide pool of campus talent to find creative ways to help students succeed. The Office of Student Success Innovations (OSSI) was created more than a year ago with a mission of closing the graduation gap by engaging and empowering faculty, staff and students to work collaboratively to develop ideas that expand educational equity and student success. “The plan is to figure out how to close the gaps at CSUN using institutional data — including raw numbers about students’ performance in priority courses (courses needed for graduation) as well as information we already have about what works and what doesn’t — and turn it into innovative ways to help our students succeed,” said OSSI director Kristy Michaud, a professor of political science. The effort began before the California State University Chancellor’s Office announced its Graduation Initiative 2025 — a plan to increase graduation rates for all CSU students while eliminating gaps in graduation rates between better served and underserved students and between lower income and higher income students — earlier this year. The OSSI mission to increase equity in course-level outcomes, retention rates, and graduation rates aligned with the goals of the chancellor’s office initiative. Opportunity gaps are the result of disparities in resources available between students, often because of racial, ethnic or socioeconomic status. The raw data can provide insight into which students may be having trouble accessing resources and help faculty identify which students they are not getting through to. If it’s just one, the problem can be tackled on an individual basis. But if it’s several, Michaud said, the solution may require a reassessment of the course, how its presented and the resources available to the students. Collectively reviewing the data provides an opportunity for faculty and staff to brainstorm about possible solutions to the problems — solutions that may lie outside that one classroom. And it lets faculty members know that they are not alone in their efforts to help their students, Michaud said. Michaud said the response to OSSI’s efforts has been positive. Faculty and staff are brought together in interdisciplinary communities and are given course- and section-level data on gaps in rates of non-passing grades between students. The information collected by CSUN’s Office of Institutional Research includes gaps between students from different racial and ethnic backgrounds. While those taking part in the discussions are provided with evidence-based strategies to help close those gaps — such as a learning-centered syllabus design, transparent assignments and grading, high-impact practices and metacognitive interventions (using class time to help students think about how learning works) — they also are encouraged to come up with their own solutions. One such session, about a year ago, resulted in an immediate change in how the College of Health and Human Development (HHD) welcomed its new students. “Often, students in a particular major won’t see their faculty in that major until their junior year, once they get all their general education requirements out of the way,” Michaud said. HHD recognized the importance of welcoming new students to majors in its college when they first step on campus, so HHD now holds a special orientation for its new majors to make them feel welcome and familiarize them with resources within the college that they can tap into when they need help. The idea is quickly being adopted by other colleges on the campus, with each college tweaking the idea to fit students in their unique majors. As the initiative moves forward, OSSI staff and faculty are regularly assessing the efforts to close the opportunity gaps, particularly in high-priority courses, as well is in one-year continuation and graduation rates. Key to OSSI’s success so far, Michaud said, is “the freedom we’ve given people to try something new. “We do not expect to change campus culture overnight, but we hope that by engaging campus stakeholders in all areas and levels, we will see many small changes that should result in transformation at the institutional level,” she said.